Hello! Welcome to the Taylored Expressions April Release Day! All of the products that we have been peeking the last couple of days are now available in the TE store in the Fresh Out of the Oven Department! 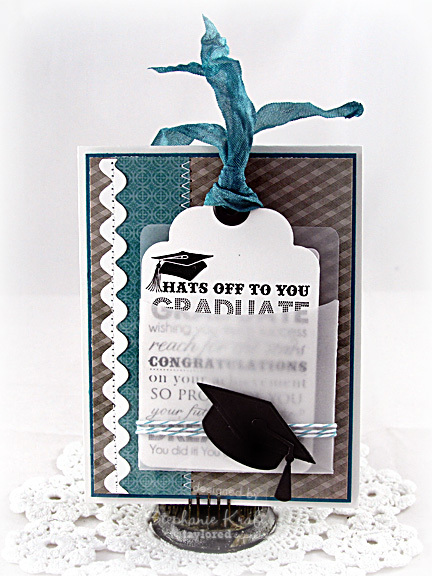 Today I am featuring the Graphic Greetings - Grad A la Carte stamp set. I made a card with a pocket that holds a gift card and a tag/bookmark using the new Tag Stacklets 1. I used the Library Pocket Die to create my pocket out of vellum so you can still see some of the words on the tag. On the front of the pocket, I tied some Divine Twine around and added a graduation cap using the Grad Cap Die. I also added the smaller Ric Rac Borders to the left side of the card. Accessories: Taylored Dies: Grad Cap, Tag Stacklets 1, Ric Rac Borders, Library Pocket Die (Taylored Expressions); Divine Twine, Brad (WRMK), Seam binding, Mallard Glimmer Mist (Tattered Angels), Foam tape, Thread, Sewing machine. So fabulous, Stephanie! Love the vellum envelope. LOVE the pocket!! Super sweet card. BRILLIANT! Hi Stephanie! Love the vellum pocket - awesome idea that I will be copying!! :-) Your grad card is gorgeous. XO Happy Release Day! What a cute card! Love the pocket! This is soooo cool - the tag/sentiment/vellum pocket/gift card combo - WOW!!! So very clever to make a vellum pocket...definitely will need to give that a try later! Fun idea to use the tag as a bookmark too!